It’s June 1st. This means the Sofia Pride Parade is only days away. Similar events take place all over the so-called free world, but in Balkan countries such as Bulgaria the Pride Parade has a much higher significance, due to the excessive homophobia in the region. 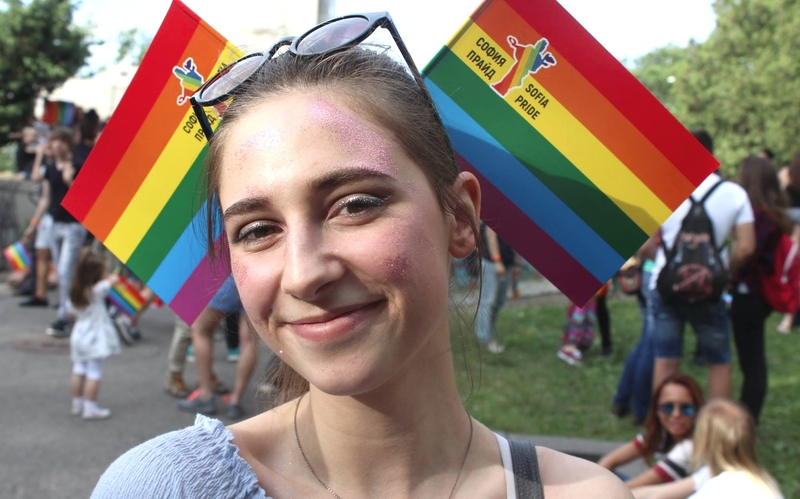 “I go to the Pride Parade because on no other day is Sofia so colorful, and because the smile will not leave my face”, Gloria adds. Bulgaria’s LGBTI community is used to hate speech, a fact which of course does not make it right. Some of the most disgusting statements just came from the “Patriots for Sofia – IMRO” and “Ataka” in Sofia’s Municipal Council. Representatives of those radical parties, which are even part of Prime Minister Boiko Borissov’s government coalition, called the Sofia Pride Parade a “gay and HIV Marathon”. Those haters said Sofia Municipality should not support any events of this kind, including the “parade of madness”, which wanted to force society “to accept a third, fifth and tenth gender.” Yes, this kind of talk is normal in Bulgaria, in the sense that there is a lot of it. But it is still hate speech which should be rejected and fought. Every statement of hate and every attack against the LGBTI community makes the Sofia Pride Parade even more important. One thing is certain: The haters will not win. At the same time it might take a generation or even longer until homosexuals in Bulgaria have the acceptance level they have in Scandinavian countries, in Germany, in Israel, or in parts of the United States of America. There will be quite a few events leading up to the big event on June 9th, 2018. They include a “Big Gay Book Club” and an entire series of events under the title “Sofia Pride Arts”. Simeon Vassilev from the GLAS Foundation, who is part of the organizing committee, even got to talk about the events on Bulgarian National Television. That in itself is a step forward. Simeon Vassilev also announced something hardly anyone will truly believe until they see it: “For the first time in 11 years, we are expecting a representative from Sofia Municipality. It will not be the Mayor though”, he indicated. “But we had a meeting with Mayor Yordanka Fandakova who said she would take care of security, as usual.” According to him, Sofia Municipality is actually supporting the Sofia Pride Parade financially. This is another big step forward, and part of the momentum mentioned in the headline. This year’s program is proof for the fact that neither Radoslav Stoyanov nor Simeon Vassilev are exaggerating. One June 9th, the Pride Parade will start at 16:00 hrs. around the Monument of the Soviet Army, close to Sofia University’s main building. A musical program will commence at 16:30 hrs.. The actual march through Sofia is scheduled for 19:00 hrs. and is supposed to end by 21:00 hrs., but will be followed by the official After-March Party at 23:00 hrs., at Party Hall, located at Boulevard Czar Osvoboditel 10. During the main event, outdoor dance lessons will be offered, a make-up station will give participants the opportunity to “make their participation more glamorous”, and a “Pride Photobooth” will help people shoot very special Pride Parade selfies. While the Bulgarian government does not support the event at all, the exact opposite is actually the case, certain embassies do, as usual. The Americans, Israelis and many Western European diplomats keep on showing Bulgarian government politicans and members of parliament what they should do, but without success. The Pride Parade and all of the events organized beforehand, including “Sofia Pride Sports” and the “Sofia Pride Film Fest”, cost money. The organizers are relying on donations. All the information needed can be found on their donation page (in Bulgarian). In Bulgaria, the situation of the LGBTI minority is not easy at all. Therefore, the Sofia Pride Parade deserves support. Everyone should take part, including heterosexuals, in order to show solidarity. Taking part means saying no to intolerance and hatred, and saying yes to the same rights for everyone. The constant growth of the Sofia Pride Parade and the fact that more businesses are showing support is definitely positive. Yes, it’s the momentum again. There is also hope that today’s younger generation of Bulgarians will turn out to be far more tolerant. Up-to-date information on the Sofia Pride Parade can be found on the event’s Facebook page (mostly in Bulgarian).